We came upon St Hubert’s, my good friend and I, very late one night and many years’ ago. We were young, and had been indulging that well-known youthful pastime, ‘Visiting Old Places After Dark To See If You Get Scared’. As we walked up the hill through the still Hampshire night toward the church, it seemed as though a kind of mist, or mesh, descended in front of our eyes. Something made us stop, pretty much simultaneously, and retrace our steps as quickly as possible. Or even faster than that. Personally, I remember being completely terrified and had the impression that it was only OK to call at St Hubert’s during daylight hours. Which was a shame, because the experience produced an unexpectedly sinister emotion about a wonderful little place that I had been visiting, off and on, for years. Of course, it could have been a side-effect of several pints of HSB from the now much-missed Gales Brewery on my part. But my chum was teetotal in those days, so we remain mystified as to the cause of this profoundly memorable event. I have been back since (in daylight) and St Hubert’s, the little church in the field, is as welcoming and beautiful as it was when I first saw it with my mum and dad more than 40 years’ ago. In fact, St Hubert’s, Idsworth, is so cute that people spotting it from passing trains actually make a point of visiting it. Originally dedicated to St Peter (and possibly St Paul too), Idsworth Chapel, as it is sometimes known, is nevertheless a bit of a curiosity. It stands all alone about a mile away from the nearest village, Finchdean. 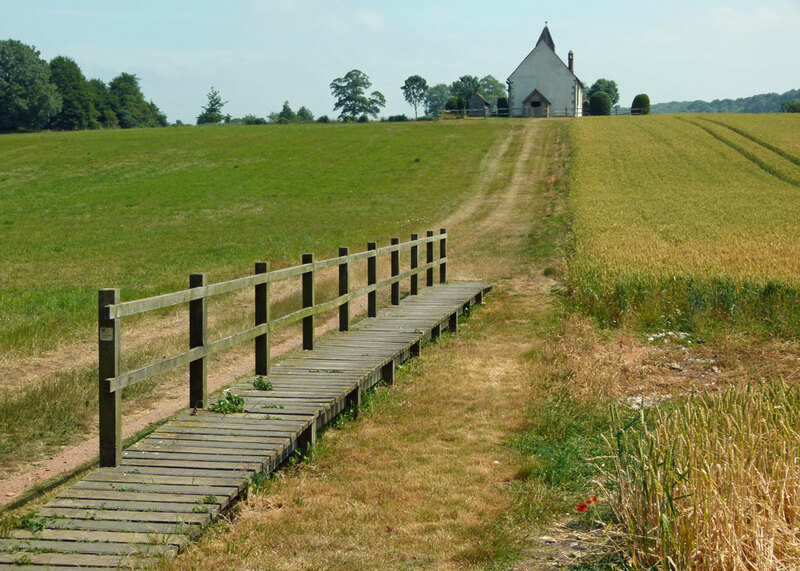 You cross a small wooden bridge over the course of the River Lavant (a winterbourne) and up the small incline to where the church – or chapel – sits in deserted splendid isolation. But what you may not realise is that you’ve just walked through the long-since vanished village of Idsworth. 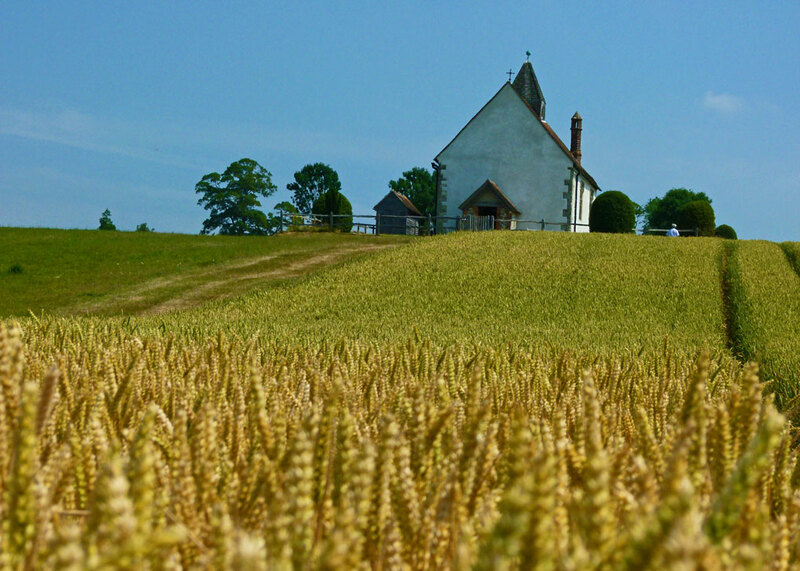 The lands hereabouts were once owned by Earl Godwin of Wessex, father of King Harold, and it is believed the chapel was built sometime before Godwin died in 1053. There may well have been a building on the site before that, though, and Idsworth could even have been settled in Roman times – coins and pottery have been found nearby. In any event, it seems conclusive that a village had been established sometime in the 9th century; but it was abandoned during the 14th – most likely due to the Black Death. I have heard it said that the outline of the village can be seen from the air, or from the other side of the valley when light snow covers the ground. Forty years’ ago, overgrown lumps in the field apparently marked the sites that could not be ploughed, but now there is nothing to be seen at all at ground level; 500 years of human habitation gone without a trace. Except, of course, for the chapel. 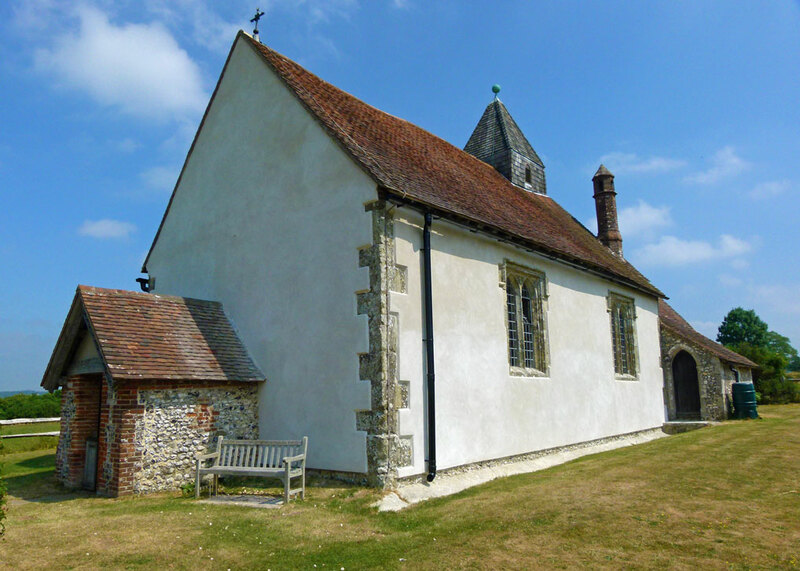 Now, this would be a gem by any standard: tiny, simple and tranquil, it seems to confidently ooze a sense of great antiquity through its masonry. The nave is the oldest part and is populated with box pews and benches. To the left of the entrance is a lovely octagonal font, which has been dated at 1400, with a base that was apparently damaged during the Civil War. The pulpit is early 17th century. 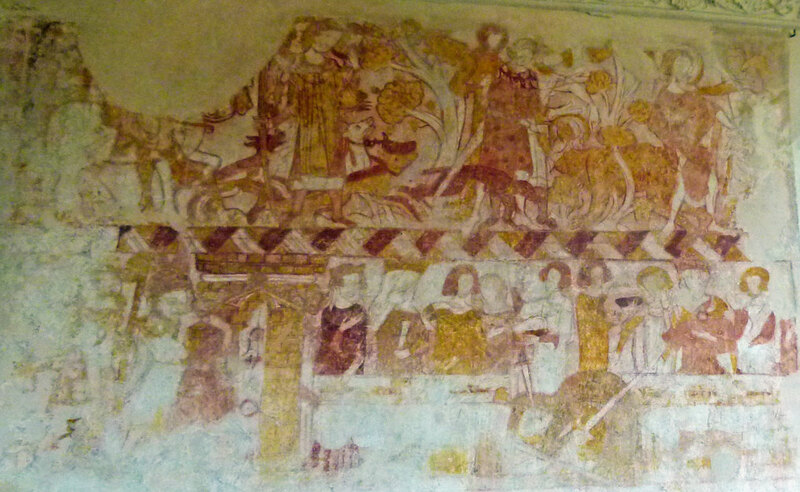 But what makes St Hubert’s even more remarkable is its extraordinary medieval wall paintings. These were probably covered over at the time of the Reformation. They include frescos of St Peter and St Paul either side of the east window, above the altar, which have been dated at c1330. But the best-known painting is a mural on the north wall – also dated at around 1330 – which is in two horizontal parts. There is some disagreement about the interpretation of this, but the official guide suggests the top half depicts a hunting scene with St Hubert, the patron saint of hunters. According to legend, St Hubert was converted while hunting on Good Friday after seeing an image of the crucified Christ between the antlers of a stag (perhaps he’d been drinking HSB too). Hubert later became Bishop of Maastricht and Liege and died in 727. The picture shows him trying to help either a lycanthrope (a man who believes himself to be a wolf), or a “hairy anchorite” ( a hermit walking on all fours as a form of penance). The lower half of the mural apparently shows St John the Baptist’s head being presented to Salome on a salver at King Herod’s feast. 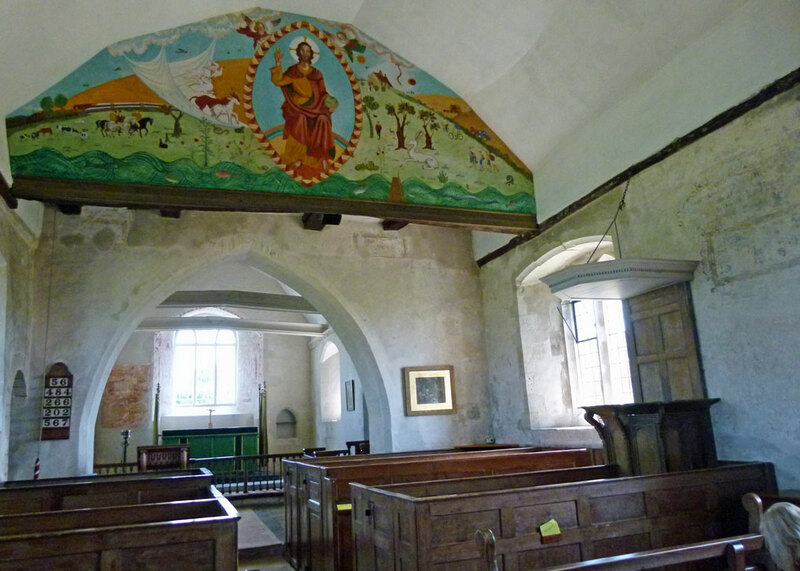 Students of medieval church wall-paintings get very excited about the ones in Idsworth Chapel. A stunning new fresco, commissioned to celebrate the millennium in 2000, sits boldly above the nave. This represents ‘Christ in Majesty’ and includes an assortment of symbols and images – including the London-Portsmouth railway, which runs nearby, and the bridge over the Lavant with the handrail on the wrong side. The answers to these questions might be found in the records somewhere, possibly those of Idsworth’s mother church, St Michael’s at nearby Chalton (Ceptune in Domesday). Or maybe you already know, dear reader – in which case do feel free to share it with the rest of us. 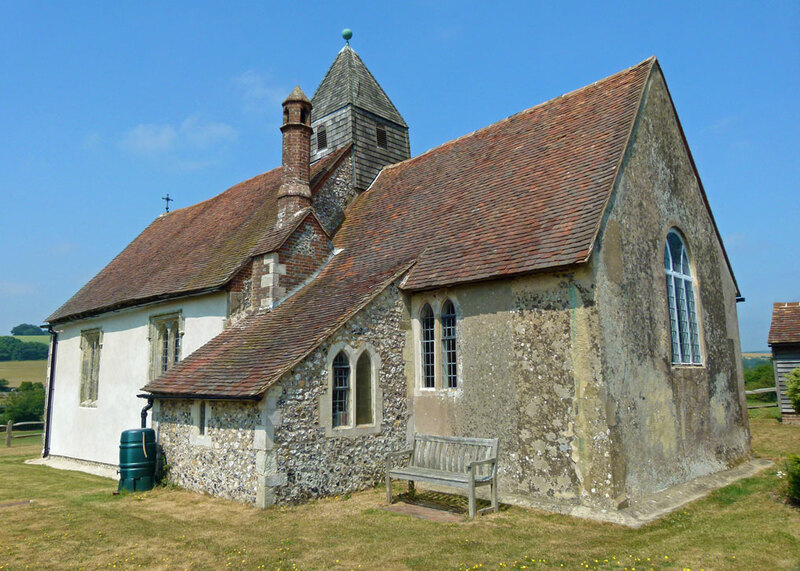 You will find St Hubert’s Chapel just about in Hampshire, to the east of the A3 at Horndean and on the road between Finchdean and Chalton. Remember that the church is an active place of worship, not a museum. As a fairly unrelated postscript to this article, I discovered that there is an Idsworth Road in Sheffield, South Yorkshire; Horndean Road leads off it. I can’t help wondering how two tiny places in Hampshire came to be represented so far away in a large city in the north of England. In fact, Idsworth Road, Sheffield, apparently made an appearance in the film, “The Full Monty.” Naked ambition? Find St Hubert’s and other churches on the attraction directory. It’s an adorable building and given how sunny it was the day you took the pictures, it’s difficult to imagine it as spooky… But I wouldn’t wander there at night, just in case! I find the existence of ‘disappeared villages’ in England fascinating! 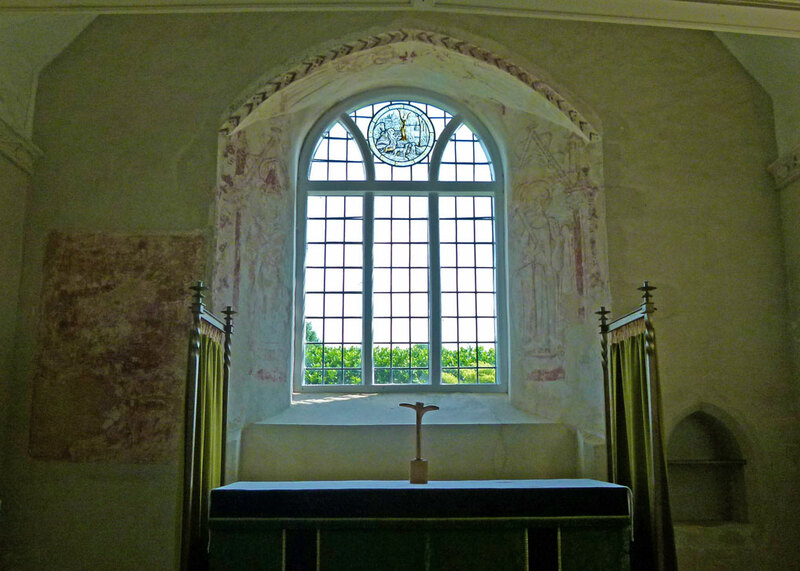 Great little church and you don’t see modern frescoes very often. Sorry the place terrified you the first time. How remarkable that it has been kept up and improved, as you say. I imagine the locals must have some idea. Unless, of course, it is the Mesh People who do it…. I like the idea of the Mesh people… – though I think they could give you the cold shudder. Wow what an amazing chapel with those rare wall paintings. The history of it is mind boggling. What a lovely little church indeed! I’ve enjoyed reading your post Mike! The church looks lovely and the history as you know it so far is interesting. Great post! I am sure the local vicar would be able to point you in the right direction regarding the church’s history. Documents are usually kept in the archive section at the County Library these days. Sheffield City Council Housing Department or Planning Department would have the records somewhere for why the roads are called Idsworth and Horndean. Of course. Actually, I think it might take some digging – and, having had the mystery in my head for sometime, it would almost spoil it to know! It’s a part of the country we never get to. Looks like a wonderful place to visit, but I’m susceptible to ‘weird’ and, if I ever get there, I’ll avoid it after dark. Hi Mike – what a fascinating church – and how interesting. Your chilling emotional experience must have made a big impact … and yes wouldn’t it be wonderful to know more. and our subconscious detected that but that wouldn’t explain the being watched feeling. I know if you stare at the back of someone’s head long enough they start looking around and feel somethings not right but this was a really isolated glen with no-one around for miles. Lovely little church that, must remember about it and try to visit sometime.